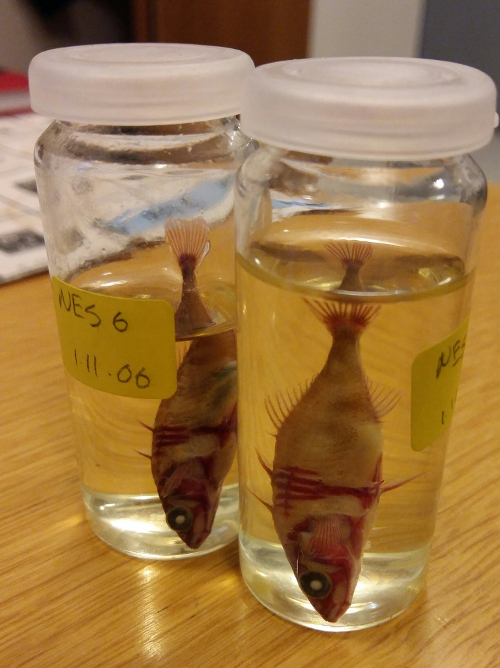 Two PhD positions on ECO-EVO-DEVO dynamics in threespine stickleback of lake Mývatn, Iceland. Hólar University College, Iceland, seeks two PhD students for a Grant of Excellence (RANNIS) project to study the dynamics of Ecological (ECO), Evolutionary (EVO) and Developmental (DEVO) processes The phenotype, including developmental plasticity, is an important determinant of the dynamic interactions between ecological and evolutionary processes (eco-evolutionary dynamics) and the processes that shape biological diversity in face of global change. This project will study the interplay among ECO, EVO and DEVO to fill knowledge gaps in 1) the dual role of ecology in evolution (as driver of natural selection and phenotypic plasticity), 2) the molecular mechanisms underlying phenotypic variation, and 3) the feedbacks between phenotypic change and ecosystem function. The project takes a spatio-temporal perspective, using threespine stickleback (Gasterosteus aculeatus) from lake Mývatn, Iceland, as a model. The project is lead by Prof. Bjarni K. Kristjánsson (lead PI, Hólar University College, Iceland) and Dr. Katja Räsänen (Swiss Federal Institute of Aquatic Sciences, Eawag, Switzerland). It is part of a large collaboration across Hólar Univ. College (Prof. Skúli Skúlason), Eawag (Dr. Blake Matthews), Univ. of Wisconsin-Madison, USA (Prof. Anthony R. Ives), Univ. of Iceland (Prof. Zophonías O. Jónsson) and the Mývatn research station (Dr. Árni Einarsson). The students will have the opportunity to conduct part of their research at the collaborative institutions. The two PhD projects will focus on i) the determinants of phenotypic variation and ii) consequences of phenotypic and genetic variation for ecosystem processes. Which of these aspects each student specifically focuses on will depend on their interests as well as expertise (to be stated in application, see below). These PhD student projects are an integral part of our integrative study that includes long-term field data, laboratory, mesocosm and field experiments, genomics and mathematical modelling. Location: The students will be based at the Dept. of Aquaculture and Fish Biology (DAFB - http://holar.is/en/department_of_aquaculture_and_fish_biology) at Hólar Univ. College (North Iceland) and registered at the Univ. of Iceland (Reykjavik). HUC is situated in the beautiful village of Hólar (Skagafjördur), with offices and research laboratories in the nearby town Sauðárkrókur. DAFB is an active research centre and the students will become part of a dynamic international team of graduate students and faculty. The beautiful natural setting and easy travel allow both outdoor and cultural activities. Requirements: The candidates must hold a MSc degree in a relevant field (e.g. Ecology, Molecular Biology, Evolution, or Development). The ideal candidates have a strong interest in evolutionary ecology, enjoy working in a dynamic group, and have experience from fieldwork and laboratory work (with relative importance depending on the project specifics). Expertise and interest in molecular genetics (transcriptomics and/or genomics) is preferable. Peer-reviewed publication(s), previous experience with animal experiments (fish in particular) will be a plus. The candidates will gain experience in integrative approaches to test pertinent hypotheses in eco-evolutionary. The positions are funded for three years. The working language is English. The students have to be able to work independently as well as a part of a team. A valid driving license is a requirement. Applicants should send an application letter, with a statement of research interests (and favoured topic of PhD) and relevant experience (max. 2 pages), curriculum vitae with a list of publications, copies of academic qualifications and the names and e-mail addresses of three referees, as a single pdf to ecoevodevo@holar.is latest March 15, 2019. Preferred starting date is May 1 st 2019. For further information contact Bjarni K. Kristjánsson (Head of the Dept. of Aquaculture and Fish Biology, Hólar Univ. College) (bjakk@holar.is) or Dr. Katja Räsänen (katja.rasanen@eawag.ch).